Your interest in this subject is appreciated and I am glad that we have the Bible as our source book to tell us what God expected of the wife in the marriage relationship. There are several verses in Ephesians, the fifth chapter that you should read, beginning with verse 22. Let me read only three of these for you. Verse 22, "Wives submit yourselves unto your own husbands, as unto the Lord". Then verse 24, "Therefore as the church is subject unto Christ, so let the wives be to their own husbands in everything". Then verse 33, "nevertheless let everyone of you in particular so love his wife even as himself; and the wife see that she reverence her husband". Then in I Peter 3:1, "Like wise you wives, be in subjection to your own husbands". None of these passages teach that women are inferior in intellect, but that her feminine qualities preclude her being as well endowed for leadership. The subjection does not mean servitude. It is not the relationship of master and slave or as a maid or servant. Hers is a recognition of the husband's leadership, wisdom and tenderness. He should be as loving toward her as Christ loved the church. At this point, there are several privileges that belong to the wife. For instance, she is to be loved like Christ loved the church as commanded in Ephesians 5:25. She is to be honored as none other in I Peter 3:7, and she is to be praised by her family, Pro. 31:28. In Titus 2:4 we read, "That (the aged women) may teach the young women to be sober, to love their husbands, to love their children, to be discreet, chaste, keepers at home, good, obedient to their own husbands, that the word of God be not blasphemed". Here is a fine list of the responsibilities of the wife. All of these are important, but let us just dwell on four of these. "To love their husbands" is a command. Too often this is equated by men to believe it is only a sexual relationship and in the mind of some women, that is all they think they are good for. To love your husband means that you are a partner with him, working together toward a common goal. Then you can be appreciative of his actions, efforts and work in supporting the family. You will do all that you possibly can to see that they are comfortable and happy when they come home. "To love their children", is another command. As men provide for the family financially, mothers stay home and rear the children. This might often be considered a thankless job. This is an area in which you can excel. As he earns the living and supports the family, you take care of the children while he is gone to work and make the house comfortable by keeping it pleasant and enjoyable. Yes, children can become exasperating at times, but remember, they are children who are still developing and learning. They need that sober guiding hand of the mature mother who lets them know that they are the objects of her love and concern. "To be obedient to their own husband" points out the closeness of the two." This is not indicating that You can't and do not have any thoughts of your own The idea is that as husband and wife work together and that you are not constantly pulling in an opposite direction. This obedience does not mean that you are a slave or an indentured servant, but rather that you are sharing a mutual goal. The harshness of the word obedient is tempered by the display of love and affection that the husband shows his wife. "To be keepers at home" is a command that indicates a divided responsibility. 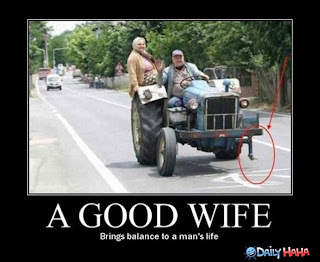 His job seems to be to go out and earn the living and provide for his family while she looks after the home. Even though a wife does not work outside of the home in what we call public work, she is still vital to the income of the family. Hers is a non-income producing activity, but it is still vitally important to the overall success of the family. When God created woman, she was taken from the rib of man as is described in Genesis. She was not taken from his foot that she might be crushed underneath his heel in bitterness. Neither was she taken from his head so that she might rule over him. She was not taken from the hand so that she might continually fill the position of waiting upon him. She was taken from the rib on man that she might be by his side continually. She is to be loved and is to respond as a part of his body. Husbands and wives are a part of each other. Let me call your attention to the Old Testament in which the writer Solomon describes a worthy woman. It is Proverbs 31:10-31. (Read). These verses quite explicitly give us God's view of a wife and mother.